VOB is a file format which was primarily developed by for the DVD players and other types of disc players. In the present time, technological pace is very high which enables the users to access advanced devices which support the advanced versions of video formats. In this course, VOB videos are not supported by many media players including the Windows Media player. Hence, there is a need of conversion of VOB file format into MPEG-2 to watch VOB videos on different types of devices. KeepVid Video Converter is a great converter which allows the conversion of video files from one format into the other. 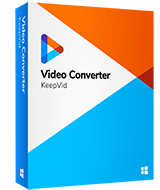 KeepVid Video Converter is an outstanding and easy to use converter which allows the conversion of one file format into the other. 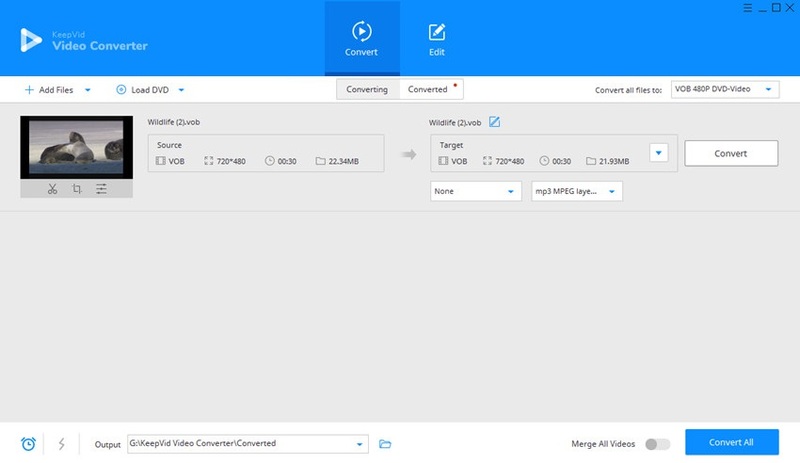 If you are considering this video converter as a VOB to MPEG-2 converter, it is a great choice. This is because KeepVid Video Converter allows the conversion of downloaded and recorded videos in VOB format into mpeg2 format. Users have to run the set up on their Windows or Mac devices and Android or iOS devices to convert the videos free of cost. There is a need to add the videos which you need to convert into MPEG2 format. After this, it takes few seconds to convert the videos in high quality and internet friendly MPEG2 format. This converter helps to convert videos to more than 1,000 video and audio formats. It also helps to download videos from more than 10,000 video sharing sites. This video converter can convert videos with 30X faster converting speed. It offers different converting modes for you to convert videos. This convert enables you to edit videos with many helpful features. Step 1. Start KeepVid Video Converter and add VOB file from your computer. Step 2. Select MPEG-2 as output, and click the Convert button to start converting VOB to MPEG-2. Launch KeepVid Video Converter after the installation. You can add the VOB file into the program window by dragging and dropping or clicking the Add Files button. Click the inverted triangle at the upper right corner and choose MPEG-2 as theoutput format in the drop-down menu. 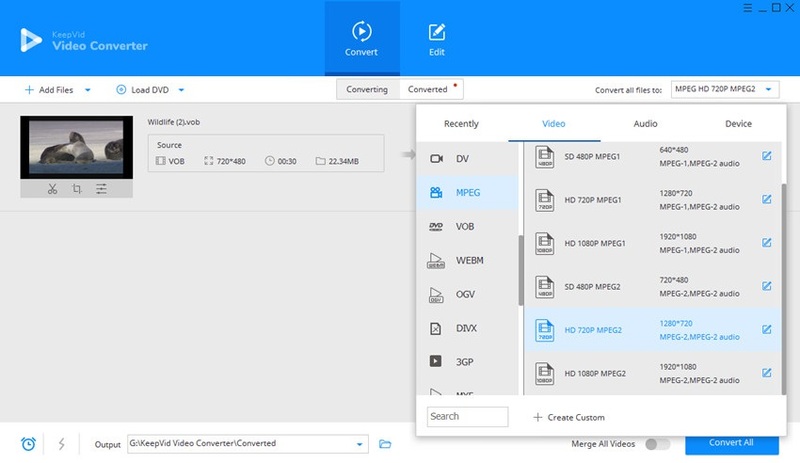 Click on “Convert All” button at the bottom and start to convert VOB to MPEG-2. •	You can save your converted videos in a solid path so that you can find the videos easily. • Take advantage of the batch conversion feature to convert multiple videos at one time. •	Check whether the converted video format is compatible with your device. KeepVid Online Video Converter: This is the best online video converter which can convert VOB format into MPEG2. It is easily accessible by visiting its official website where you can add the URL of the video website. This vob to mpeg2 converter will open the video in other formats which can be downloaded before converting into MPEG2 format. 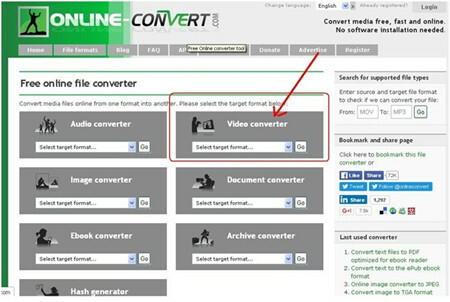 Online-convert: This is an online converter that allows the conversion of media files easily. It supports formatMP3, MP4, MKV, WMV MOV, WAV, MPEG-1, MPEG-2 and many more. Upload the video online or enter the URL in the built-in browser on this site to find the videos which you want to convert into mpeg2. Any Video converter: It is an all-in-one video converter which allows fast conversion of the videos from VOB to MPEG2 format. This video converter is compatible with Windows Vista/7/8/10 and Macbook. It is freeware so anyone can use this software by downloading it on their device and adding the videos which they want to customize. This VOB to MPEG-2 converter is free of cost and supports HD quality input and output videos. HTML5 videos can be created with embedded code which is ready for website use. Allow the users to take the screenshot of the videos to create their own collection of photos. Wondershare Video Converter Ultimate: VOB is the core formats of the files on DVDs. This is however less popular than MPEG 2 which is of the standard quality file format and supported by several web browsers.VOB format does not maintain the editing so most of the users prefer to use Wondershare for converting videos from VOB to MPEG2 which is the high quality streaming video format on internet. Original quality of the videos remains same after compression..
Wondershare Video Converter Ultimate is compatible with Windows and Mac. Offers multiple editing features for users.